From April 13-16, MIPTV, “the world’s most-established TV and digital content market and the biggest gathering of entertainment industry professionals” took place at the Palais des Festivals in Cannes, France. The agenda was filled with speakers and exciting displays from many corners of the industry. Here are some select attendee reactions, presenter remarks and highlights that capture the event. One of the major announcements was Slashtag TV, a France-based service that describes itself as the "first interactive online channel." "Using device synchronisation, your phone will recognise the content you’re watching and provide fun little games or supplements to the content," said 360 director Martin Laugery. Ze Frank, president of Buzzfeed Motion Pictures, and film producer Michael Shamberg discussed how they're going to be conducting experiments with video content. “We have a lot of flexibility in testing out the future of distribution itself. Everything is on the table from the idea of free to the idea of windowed exclusive to giving it to the box office and letting them keep 100% of receipts, and treating it as marketing,” said Frank. 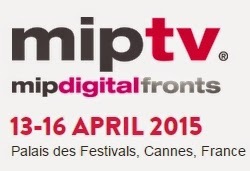 MIPTV was also generous enough to record many other seminars over the past three days. You can locate them on their YouTube channel.